When Milos Raonic walks onto Centre Court for his opening-round Rogers Cup match against Yen-Hsun Lu on Wednesday night it will be his eighth appearance at Canada’s premier tennis event. In 2008, just 17 and with an ATP ranking of No. 931, Raonic lost 6-3, 6-4 in the first round of qualifying to No. 203 Alexander Kudryavtsev of Russia. It was an inauspicious debut by a player with some promise but still a long ways from being a can’t-miss prospect. His highest International Tennis Federation ranking as a junior was No. 35. In fact, what this reporter remembers most about him then was an opening-round match in the junior boys event at Wimbledon in 2008 against a British wild card named James Chaudry. The match was on Court 16 or 17 and it was basically just about a single shot that Raonic pulled off. He went to his forehand side and absolutely drilled a squash-type forehand that lasered barely over the net and, to everyone’s astonishment including Chaudry’s, landed in. Raonic won that match but lost in the second round 6-4, 6-4 to Henrique Cuhna from Brazil. The match that signalled a real Raonic breakthrough was a year later at Rogers Cup in Montreal when he qualified – beating No. 77 Teymuraz Gabashvili and No. 113 Michael Llodra. In a first-round match played in the Banque Nationale stadium, Raonic, ranked No. 679, created tremendous excitement and drew an overflow crowd to the passageways high above the court as he reached match point against then-world No. 10 Fernando Gonzalez. The Chilean then engaged in a little gamesmanship by stalling just enough before he served to allow Raonic to feel the nerves of the moment. Gonzalez defended the match point and went on to advance 4-6, 7-6(6), 6-4. But Raonic was hardly about to sky-rocket up the rankings. It wasn’t until the fall of 2010, more than 12 months later, that he made a move that hehas virtually continued to this day and his career-high ranking of No. 4 in May 2015, and an appearance in the Wimbledon final earlier this month. In that fall of 2010 in Kuala Lumpur, Tokyo and Tashkent, he beat players ranked No. 105 (Kunitsyn), No. 31 (Stakhovsky), No. 102 (Ilhan), No. 70 (Serra) and No. 95 (Devvarman). As a qualifier, he famously lost 6-4, 6-4 to Rafael Nadal in the Japan Open round-of-16 with the then-world No. 1 proclaiming that Raonic was a future Top 10 player. Three months later in January 2011, Raonic qualified and reached the round-of-16 at the Australian Open and was the revelation of the tournament. The rest of his story is history and now winds its way to Wednesday night as he begins his quest to be the first Canadian to win this country’s premier tournament since former St. Andrew’s College (Aurora, Ont.) headmaster Bob Bedard in 1958. Raonic enters Wednesday’s match against Lu not only as a strong favourite – leading their head-to-head 2-0 – but as probably the second pick to win the tournament behind world No. 1 Novak Djokovic. Even if No. 2 Stan Wawrinka and No. 3 Kei Nishikori are seeded higher than him, No. 4 Raonic has definitely been the better performer over the past few months. It’s not hard to think that Raonic, the hometown boy, is at the top of that list. The Raonic – Lu match will be at 7 p.m. on Wednesday night to be followed by Denis Shapovalov vs. Grigor Dimitrov. Shapovalov will have had a full day to get over his 7-6(2), 3-6, 6-3 upset of world No. 19 Nick Kyrgios on Monday night. It brought with it a lot of media attention but he has tried to keep his mind on the tasks at hand and that included a doubles match on Tuesday. He and partner Félix Auger-Aliassime (below) were beaten in a first-round match 6-4, 6-3 by Bernard Tomic and Viktor Troicki. Shapovalov’s chance for a win over Dimitrov on Wednesday partly depend on how the 25-year-old Bulgarian plays. Including losing the final in Istanbul in May to little-known Argentine Diego Schwartzman, Dimitrov’s record is 21-16 on the year. In that final, Dimitrov totally lost his cool after having a set and 5-2 lead and wound up being defaulted after two point penalties, the second on match point to end a 6-0 final set. He has looked completely unlike the player who played in the Wimbledon semifinals two years ago, the same year as Raonic. Last week he lost to No. 82-ranked Dan Evans of Great Britain in Washington and was close to exiting in his first round on Monday in Toronto when he trailed by a set and 5-2 in the second-set tiebreak against No. 107-ranked Yuichi Sugita. Had the 27-year-old Japanese not fallen victim to nerves, he, not Dimitrov, could easily have been the player facing Shapovalov Wednesday evening. The 17-year-old Shapovalov came to Canada from Israel when he was nine months old but the family roots are in Russia. Speaking the language has made it easier in the locker room with some players. “Mikhail Youzhny came up to me and we started talking in Russian,” Shapovalov said Tuesday. “When I was younger, I was at Rogers Cup, I got a picture with him. He was a star for me. And now you’re in the locker room with these guys, you’re living with these guys. It’s completely different now. Following Raonic onto Centre Court at Avia Centre on Wednesday is heady stuff for the 17-year-old from Richmond Hill, Ont., who just one year ago was at the Ontario Racquet Club in Mississauga, Ont., winning the Canadian junior (under-18) title over Auger-Aliassime before no more than a couple of dozen people. On Wednesday night there should be close to a capacity crowd of 10,985. In a first-round doubles match on the Grandstand on Tuesday, Canadian wild cards Philip Bester and Adil Shamasdin defeated Serbs Novak Djokovic and Nenad Zimonjic 7-5, 4-6, [10-2]. Bester and Shamasdin had been a combined 0-11 in matches at Rogers Cup. About playing the world No. 1, even if it was in doubles, Shamasdin said, “I think going into a match like this we were focused on what we’re doing on our end, and we’re not really kind of worried about what they’re going to do. 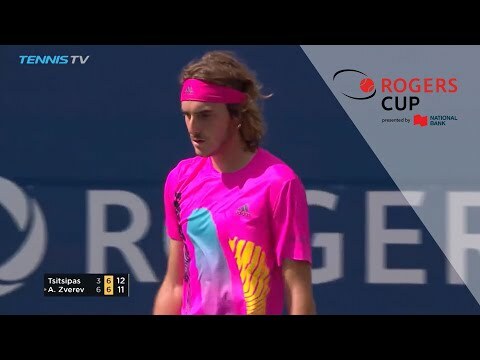 Four of the five Canadians in the first round of Rogers Cup emerged as winners, with Vasek Pospisil completing the quartet when he defeated Jeremy Chardy 7-6(3) ret. (foot injury) on Tuesday evening. Frank Dancevic, who lost to Sam Querrey on Monday night, was the only Canadian failing to advance. Pospisil, who had lost nine of his previous 10 matches, dropped his serve in the opening game of the match but promptly broke back and then he and Chardy held serve until the tiebreak. A double fault by the 29-year-old Chardy in the tiebreak helped Pospisil take control. At the end of the set, Chardy had a visit from the physio and decided to retire. That moves Pospisil into the second round and a match-up with No. 14-ranked Gael Monfils. Monfils, 29, won the Washington ATP 500 event on Sunday and might have been expected to be a little leg-weary for his first match on Tuesday. But he handled the combative Joao Sousa of Portugal 6-3, 6-3. The two have only played once with the Frenchman prevailing 7-6(4), 7-5 in the second round of Shanghai in 2013. A dead rubber Davis Cup match in Vancouver in 2012 should not really count even if Monfils won 6-4, 6-4 in a display that was much more Harlem Globetrotters have-fun than serious competition. The match might not be too late. It is scheduled for fourth on the Grandstand starting at 11 a.m. – which would make it at approximately 4 p.m. or 5 p.m.
As a result of a 6-4, 6-2 victory of Jack Sock and Nick Kyrgios over Gilles Muller and Benoit Paire on Tuesday, Pospisil and Daniel Nestor, seeded sixth, will take on Pospisil’s frequent partner Sock and Kyrgios in a second-round match on Thursday. It’s the something that the tennis world has been fearing for years – a sign that Roger Federer’s sublime career may be coming to an end. Tuesday’s news that his right knee problem will force him to miss the rest of the 2016 season – albeit with a declaration that he plans to return for 2016 and beyond – is another signpost on the road to the sport of tennis without the supreme Swiss. It was not a complete surprise because a Swiss journalist at Rogers Cup this week had talked about Federer having fluid removed from his knee. For years that has been a common practice with other athletes and it’s never a good sign – at least in the short term. What’s the tennis prognosis for Federer? It’s hard to believe that basically six months away from the tour at age 35 (on August 8th) he will not have lost some reflexes, some strength and some of the positive match experiences that have contributed to his confidence and sense of superiority on the court. Probably the only good news in the Federer announcement is that he’s giving his millions of fans a long good bye. Already this year they have had to get used to periods when he has been unfit to play and now this longer absence will enable them to get prepared for the day when he inevitably leaves the scene once and for all. Props to Genie Bouchard and Lucie Safarova for playing the best match at either of the Rogers Cups event so far this week. Bouchard’s 6-3, 3-6, 7-6(3) victory was resplendent with bold shot-making. Both had their moments and at the very end both were giving their all and going for their shots. Bouchard suffered the disappointment of failing to convert a love-40 (three match points) advantage in the 12th game of the final set and then falling behind 3-1 in the ensuing tiebreak. But she stayed aggressive and slightly more in control, and that was the difference as she ran off seven consecutive points to win the match. It was in stark contrast to Bouchard’s opening-match exit two years ago in Montreal following her Wimbledon final appearance a month earlier. Then she lost 6-0, 2-6, 6-0 to qualifier Shelby Rogers and openly admitted afterward that she had felt the pressure of a home crowd and huge expectations. On Tuesday, with the highly-partisan crowd behind her, she performed much better and deserved to be pleased with her play whether she had won or lost.